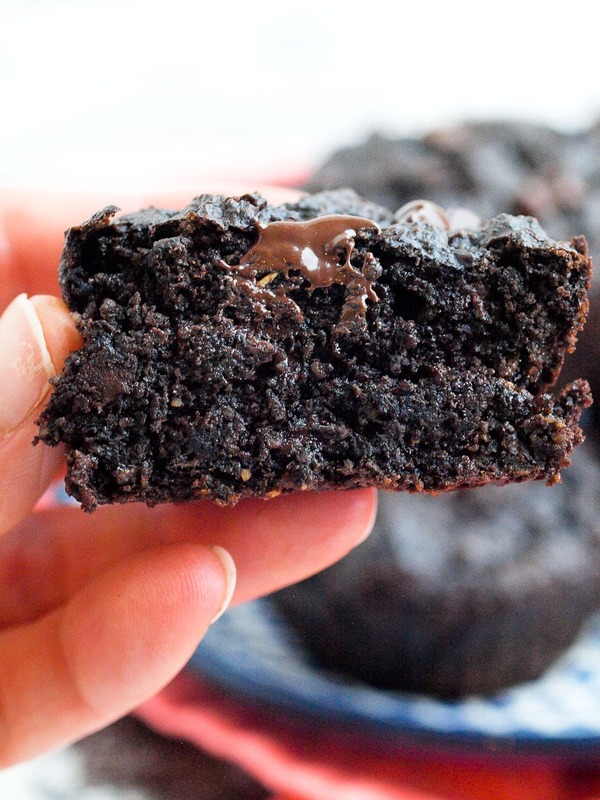 These Double Chocolate Peanut Butter Muffins with Vegetables are vegan, gluten-free, and made with a cup of vegetables inside! I serve my kids fresh vegetables every day. Not a day goes by that they don’t see vegetables in their true form. That doesn’t mean I’m above serving them extra vegetables inside their muffins. 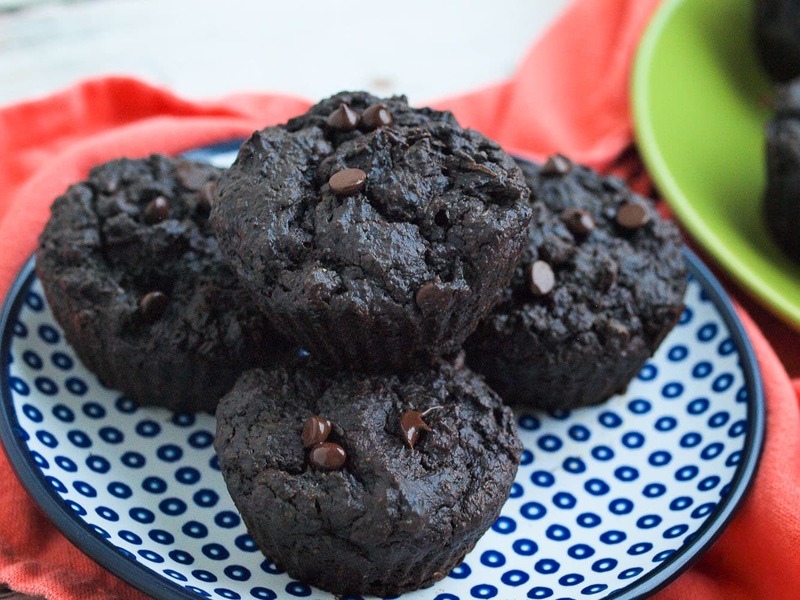 Even the pickiest eater won’t suspect that these Double Chocolate Peanut Butter Muffins with Vegetables have a whole cup of vegetable goodness baked right into them. Trust me, they’ll only be thinking about the incredible chocolate and peanut butter flavor they are getting with every bite. I used a mixture of cooked carrots and sweet potatoes for the vegetables. I think there’s definitely room to try different vegetables here (remember the Superfoods Chocolate Cake with beets?) but the carrots and sweet potatoes have a natural sweetness that works very well. The vegetables lend moisture to the mix, as well, making these the exact opposite of dry. Did I mention that these are vegan and gluten-free, also? I used oat flour that I blended from regular rolled oats (use certified gluten-free oats, if necessary) and it worked great. Vegan baking is the best because you can taste the batter with no worries. I was so excited because this batter tasted like no bake cookies! I almost didn’t bake them. These are made with coconut palm sugar, which I like because it is an unrefined sugar that retains a lot of minerals and has a lower glycemic index than regular white sugar. If you don’t have it on hand, it’s okay to use whatever sugar you prefer. Muffins tend to walk a fine line between breakfast treat and dessert. These are definitely in that category. What saves them? Hello, vegetables! Totally healthy enough for breakfast. 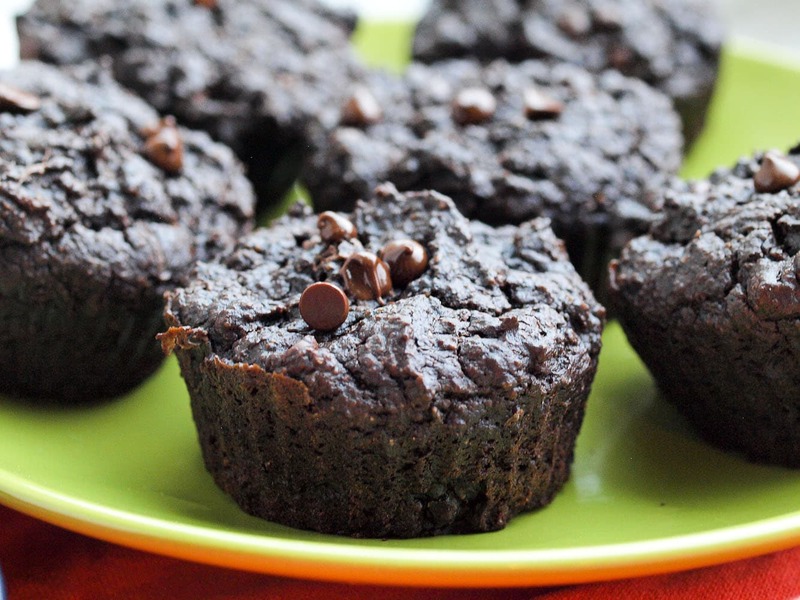 These Double Chocolate Peanut Butter Muffins with Vegetables are vegan, gluten-free, and packed with nutrition via carrot and sweet potato! 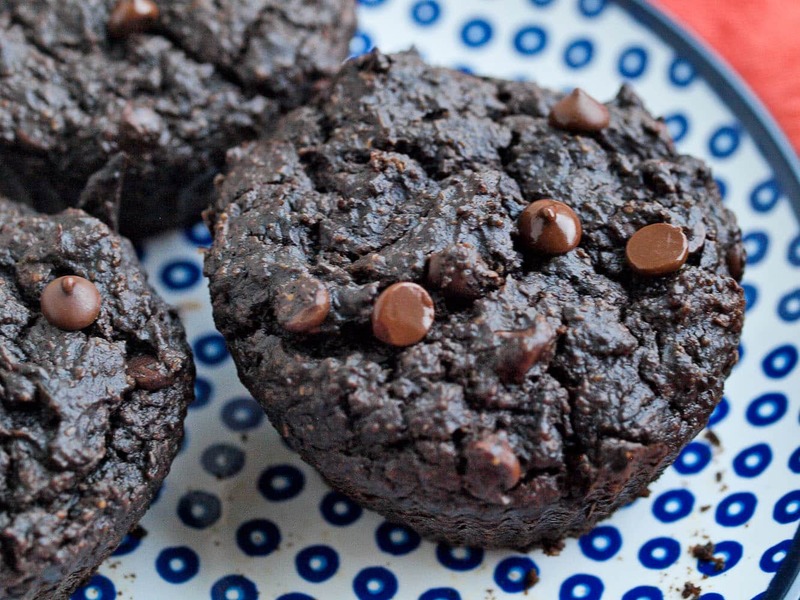 Your kids won’t ever suspect they are eating vegetables with these muffins. Line a muffin pan with silicone baking cups, or oil it well. 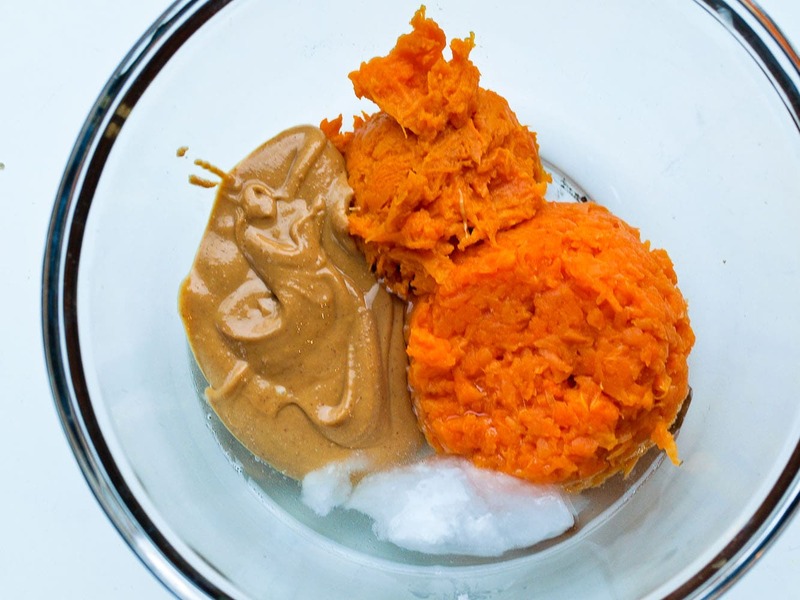 In a medium bowl, whisk together the carrot puree, sweet potato flesh, almond milk, peanut butter, vanilla extract, and coconut oil very well until you have a smooth mixture. Use a fork to smooth out any chunks from the vegetables. In a separate bowl, whisk together the oat flour, baking powder, coconut palm sugar, cocoa powder, and salt. Pour the wet ingredients into the bowl with the dry ingredients and mix until combined. Transfer about 1/4 cup of the batter per muffin cup. Bake in the preheated oven until the muffins are set and a toothpick placed in the center of a muffin comes out clean (except for the melted chocolate chips), about 20 minutes. Allow to cool before serving. Enjoy! This recipe was originally published in 2016. A new video was added 2019. These sound yummy! Carrots really are a great addition to cakes. I have added a little bit of shredded carrots to your banana bread and it tastes great! Oooh I’m going to try that with banana bread. Great idea! I have to tell you that I made them last night :). My son went to one of his friends for a play date and he took some muffins with him. Everyone loved them: my kids (4 and 7 year old), my son’s friends (9 and 14 year old) and their parents and grandmother, my husband, myself, and my parents. I know, lots of people tried them :). The only change I made was I replaced the sweet potato with pumpkin as I did not have sweet potato in the house. I wish I would have tripled the recipe :). The muffins turned out moist and with the right amount of sweetness. Super delicious! I’m so glad to hear this! 🙂 It’s great to hear that it works with pumpkin as well–I’ll use that tip when I don’t have sweet potato because I almost always have a can of pumpkin hiding in the pantry. What could you substitute if you have to avoid nuts? Kid’s school is nutfree zone. Maybe blended black beans? I made these tonight…wow! Incredibly delicious! Thank you for this magnificent recipe! I have steel cut oats in the pantry. Can I grind these up for the oat flour? I don’t think a regular blender would work with steel cut oats, but if you have a professional style blender, like a Vitamix, with a dry container, that would work. Hi! This recipe sounds fantastic but could I use all carrots if I don’t have sweet potatoes? These are AMAZING! The small amount of peanut butter comes through nicely and they’re good and moist. I’m so glad I found this recipe it’s exactly what I wanted in a muffin. Thanks so much this recipe will be repeated many times in my house!